Shoulder Rivets range by Universal Rivet Inc. Shoulder rivets have a head, a shoulder and a smaller diameter solid or semi-tubular shank. Shoulder rivets are commonly used in assemblies that require some type of movement. They are also used throughout the shelving industry to build racking systems, whereby, cross members will lockdown onto the shoulder of the rivet. Shoulder rivets also provide good joint strength and are inexpensive when compared to threaded fasteners. Shoulder rivets are ideal for high speed assembly and feed automatically in high speed riveting machines. Universal Rivet manufactures a broad range of Shoulder rivets in many materials and head styles. 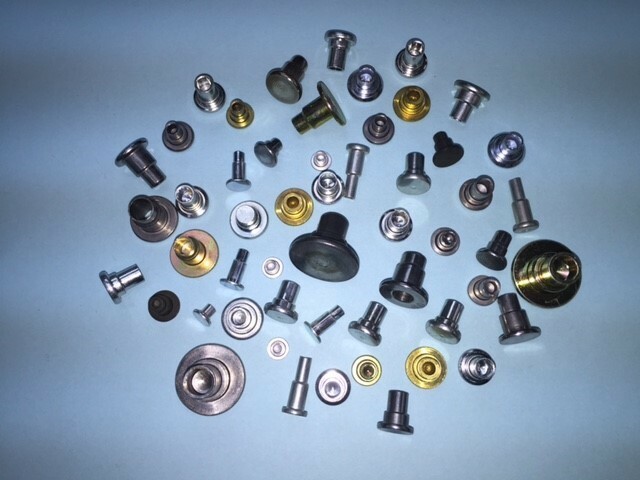 We manufacture rivets from steel, aluminum, brass and stainless steel. We offer many finishes including the most common zinc, nickel and plain finish. Plated finishes also have a wax coating to aid in the assembly process. tion. If you need a non-standard rivet, we can help. Just contact us with your specifications for a quote.